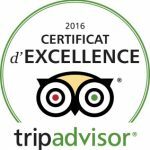 Nous avons la fierté d’annoncer à nos visiteurs que notre Hôtel Les Grands Voyageurs a gagné le Certificat d’Excellence 2016, une distinction qui reflète la constance des excellents avis que nous avons reçu sur TripAdvisor. Merci à vous. Our Hotel is located in the heart of Concarneau, in Brittany, a few steps away from the covered market, 200m from the beach and 100m from the fishing port and marina. Finistère, the most western tip of the European continent, is the figurehead and sentinel. Here ideas abound, as Finistère draws its strength from the energy of the winds and the waves.